Josephine Smith Liles, age 97, of Green Creek, NC, died Monday, May 16, 2016, at her daughters home. Josephine was a native of Polk County and the daughter of the late Caldwell Smith and the late Bessie Ridings Smith. She was the widow of the late Hubert Liles. 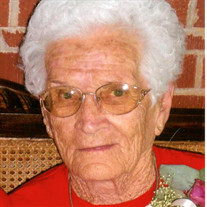 Josephine was a member of New Hope United Methodist Church. She was preceeded in death by her brothers; Whitfield Smith, Lionel Smith and a sister Arlene S. Thompson. The family will receive friends from 6:00 PM to 8:00 PM, Friday, May 20, 2016 at McMahan's Funeral Home. The Funeral service will be at New Hope United Methodist Church at 1:00 PM, Saturday, May 21, 2016 with Reverend Butch Osborne and Frank Moffitt officiating. Interment will be at New Hope United Methodist Church Cemetery. Memorials may be made to New Hope United Methodist Church, 4251 Chesnee Rd. Rutherfordton, NC 28139. Online guest register/tribute wall available at www.mcmahansfuneralhome.com. McMahan's Funeral Home and Cremations Services in charge of arrangements.